The easy way for Montessori Educators to save time, money, and trees! One more thing to add to life’s certainties. . .more paper = more clutter. Even those of us with the ability to channel our ‘inner librarian’ can only find so many places in which to file an 8 1/2 x 11 slice of processed tree pulp. Office programs like Word & Excel can help, but they just end up presenting a different set of problems. Hard drive crash anyone?? Montessori Compass is a breath of fresh air for busy school administrators! MC provides centralized, web-based, secure, and eco-friendly tools that help save time & money. MC makes it easy to streamline day-to-day activities, encourage staff collaboration, reduce efficiency-killing clutter, and lower your school’s operating costs. Your paperless office starts here! No more folders or filing cabinets. Montessori Compass will store all student data in a secure, centralized web-based “cloud” location. Parent contact info – check. Emergency contacts – check. Academic, health, behavioral info – check. Allergies, Immunizations – check. Easy access from your iPad, iPhone, Android tablet/smartphone, Mac, PC – any web-enabled device! Easily maintain accurate, up-to-date calendars! With Montessori Compass it’s easy to keep your school’s community in the know! Create school-wide or classroom-specific events. 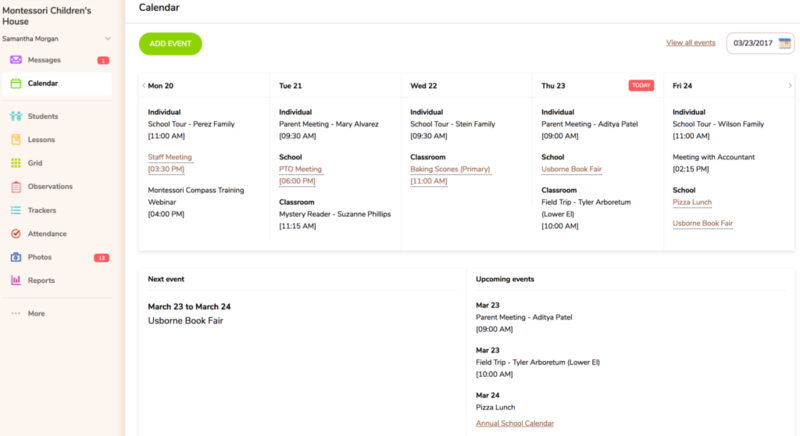 All lesson names and descriptions publish directly to the calendar. Calendars are personalized for students so parents only see events that are relevant to their respective classroom(s). Parents, teachers, and administrators can view updated daily events on the web or print an annual school calendar to post on the fridge! 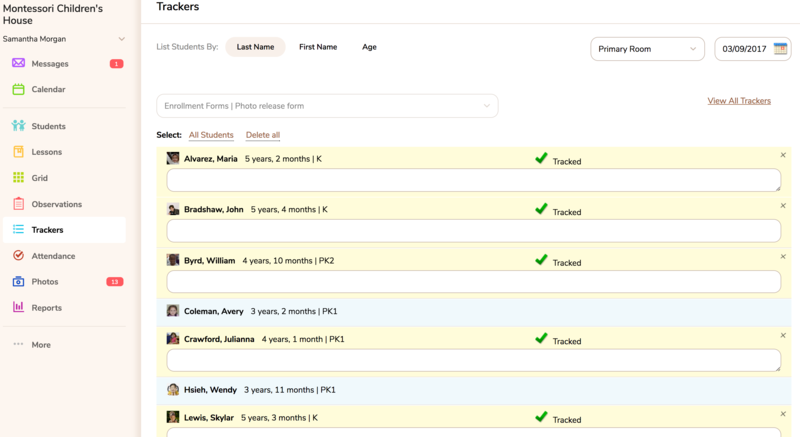 Enrollment forms, permission slips, tuition payments…create customizable trackers for any situation! Trackers are a flexible tool that enable you to create a customized list of things you need to keep track of throughout the school year. Keep track of all your paperwork, tuition payments, volunteer hours, or anything else you would like to save for future reference. Trackers can be organized by category and robust reporting capability makes it easy to monitor trackers for every child in your school. The easy way to group students together based on any type of criteria! 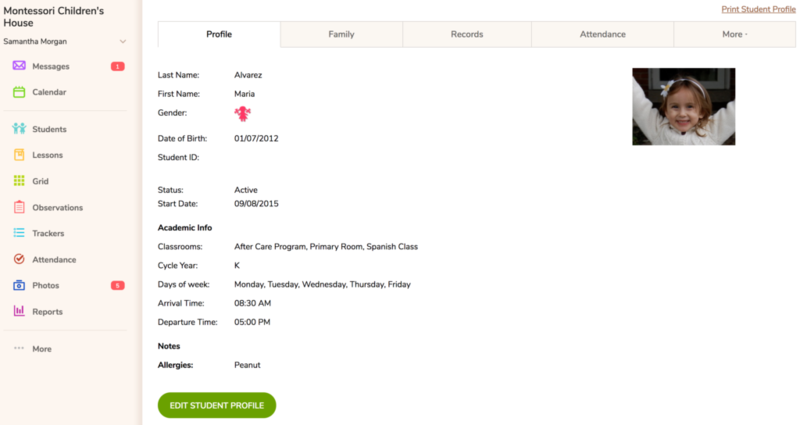 The Student Tag feature is another example of MC’s no “one-size-fits-all” philosophy. 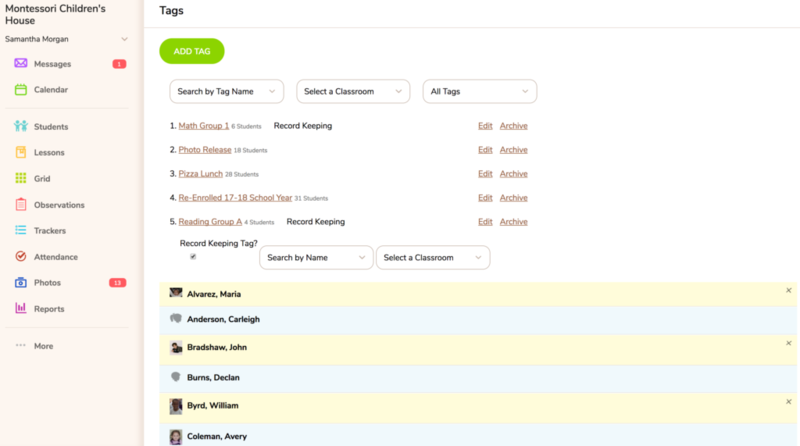 Create a tag based on any criteria you wish to group students together. For example, maybe you are posting classroom photos on Facebook and need to find out who has signed the Photo Release form. Or maybe you need to know which students will be participating in Pizza lunch. Filter your student list based on the tag and print a report! Don’t wait for progress report time to evaluate student performance! With Montessori Compass, you can conveniently monitor the progress of every student in your school on a real-time basis. Reports can be generated instantly, to help guides/administrators to ensure students are on track to achieve academic goals. 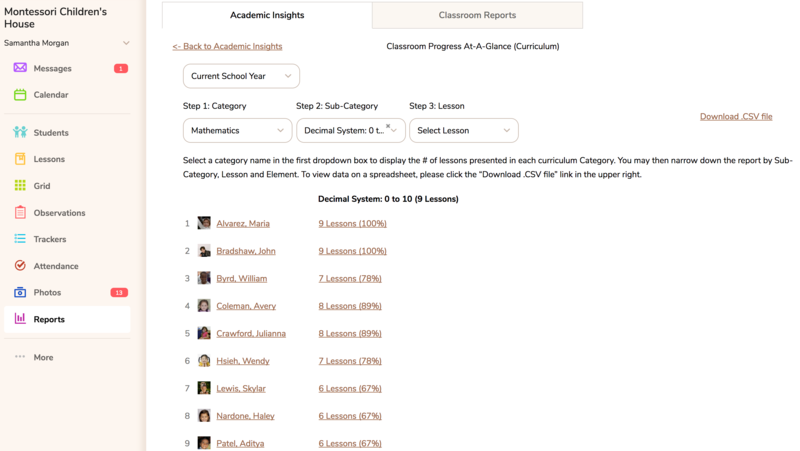 View by curriculum category, timeline of all lessons, highest recorded assessment level, or standards mapping. Reports are private and only shared with parents at the school’s discretion. MC includes a variety of useful tools to view a student’s progress including the ability to select any lesson in your curriculum and instantly see the last documented skill level for every student in your classroom! Because there’s no one-size-fits-all approach to running your school! MC was built from the ground up to be very adaptable, allowing schools from all corners of the globe to customize a variety of settings to meet their very specific needs. Custom Date Format and Time Zone – check. 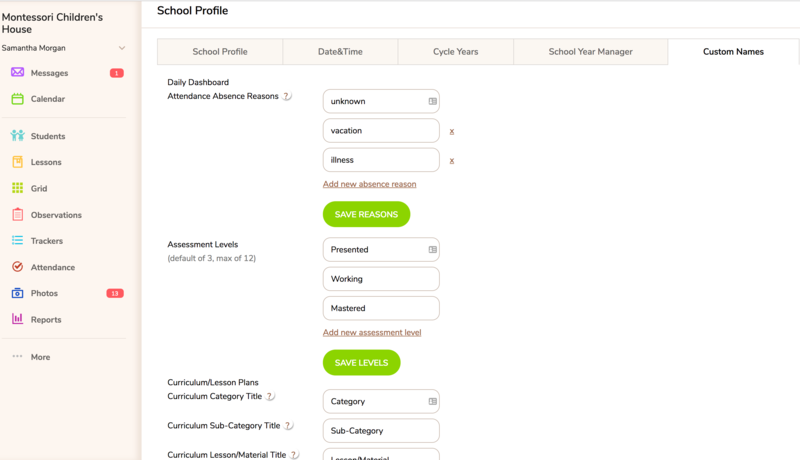 Custom Absence Reasons and Assessment Levels – check. Custom Curriculum and Cycle Years – check. Custom Allergies and Immunizations – check. Schools have full control over all communication settings including messaging, calendar, photos, email notifications, activity reports, and progress reports. Your school’s MC experience can be as unique as your school community! !